and was in pain to be delivered. Apoc: 12. As in the days that were before the flood they were eating and drinking, marrying and giving in marriage, until the day that Noe entered into the ark, and they did not understand until the flood came. Matt. 24:38. Now there is nothing wrong with getting married or eating and drinking but, “That man’s every thought and inclinations of his heart were only evil. Gen.6:5.” I would also remind you that it was about 120 years from the time God told Noe to build the Ark to the Day the rains for the flood came. In our times of the Great Apostasy (schism) the Vatican II Church is relaxing the laws and discipline of the Church to the point that now one can get a divorce and remarry and still be a member of the church. And the beast that was, and is not, is moreover himself eighth, and is of the seven; and is on his way to destruction. 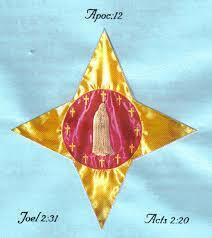 Apoc: 17:11 This is the symbol for the last week of Pentecost. But he that shall persevere to the end, he shall be saved. (Matthew 24:13) Yes, we are living in these End times when there is no true faith in God. The Great Apostasy lasts about 50 years, from all that I can gather and it OFFICIALLY began November 19, 1969 when Paul VI refuted publicly the pleas of the Traditionalists, Cardinals, Bishops, Priests and lay people. So there you have it my friends. Well my friends, the CHURCH has never put other Religions on an equal level as the Church of Christ before. The Church has never printed heretical Bibles before, where FOR ONE, they attack Our Lady’s Virginity . Isaias, A virgin shall conceive to a young women with Child. The majority of Traditionalist know of the countless changes that were made by the Vatican II Council that contradict past dogmatic decrees by the church. Once again, the Catholic Church is an institution that is made up of the facts, not opinions. Opinions make us ambiguous, slanderous, lairs or protestant. So let us not be a reflection of fog horns but rather a reflection of light houses. If we don’t help in spreading these truths, unfortunately, we will lose Grace with God, become of NO value to Him and just add to the confusion, foster our demise, and lose many more souls. May the blessings of Almighty God, Father, Son, and Holy Ghost come down upon you and remain with us until He returns, on that last Pentecost Sunday. Middle East time. Alleluia and Amen.